Young Max Aitken with his class at Harkins School. He is the first student in the back row. William Maxwell Aitken was born May 25, 1879, in Maple, Ontario. “Max” as he was to be called, was the third son, and the fifth member of a family of ten children, whose father, William Cuthbert Aitken, was a Presbyterian minister. 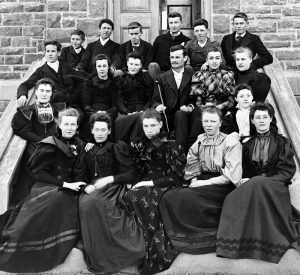 The family moved to Newcastle, New Brunswick in 1880, where Max grew into a very bright but inclined to be an “idle boy” (according to biographer David George Boyce). This particular statement was one that Max relished later in life. He attended Harkins Middle School in Newcastle. At an early he not only delivered newspapers but also started on the path as a publisher of his first newspaper (not bad for an ‘idle boy’). 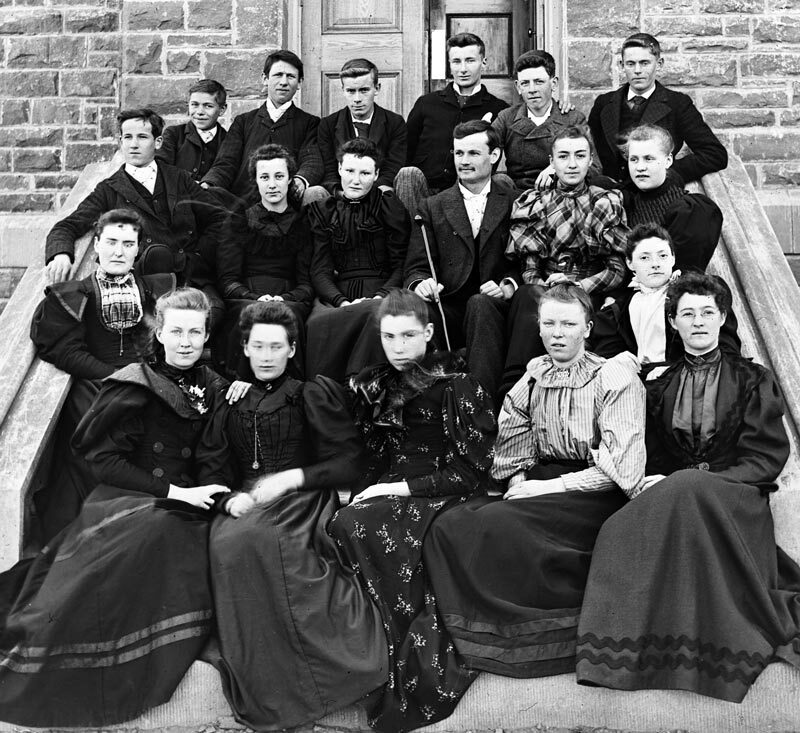 In 1895 he failed his examination for Dalhousie University, after refusing to sit the Latin and Greek papers. He moved to Chatham where he became local correspondent of The Montreal Star and an agent for Great West Life Insurance Company. He then moved to St. John with the intention of being a lawyer. However, he eventually worked full-time as an insurance agent but that did not turn out to be the course he wanted to be on. In 1900 he moved to Halifax, where he became friends and ‘apprentice’ with John Fitzwilliam Stairs, a financial expert and highly successful businessman. With the help of Stairs he began investing, buying and selling stocks on the world’s market. By his own evaluation, Aitken stated that in 1906 he was worth approximately $700,000. He continued to manipulate the markets and create mergers, thus increasing his monetary worth. On the 29th of January 1906, he married Gladys Henderson Drury who was well liked, and universally thought beautiful. She was eighteen to his twenty-six years of age. Their first child, Janet, was born on 9 July 1908. They had three children, Max the second, Peter and Janet Gladys. His wife Gladys died in 1927. Teacher described him as ‘mischievous, one of the ‘bad boys’, of the class, so his teacher put him in a front seat “to keep an eye on him”. The principal at Harkins Academy (1884-1892), Dr. Philip Cox, wrote, “He impressed me as being an absent-minded boy, as if he were always thinking of something beyond the subjects of the classroom or perhaps the next prank he could carry out with success.” He did surprise his teachers, however, by submitting a brilliant essay on Warren Hastings, in his 10th grade. Accident to the ‘boy with the big head’ . . . Broad innocent smile, freckled nose which gave him a happy-go-lucky appearance, who in the summertime roamed the strawberry marshes in his barefeet. One autumn he put on his new ‘boots’ for the first time, a passing mowing machine that was being pulled behind a cart caught his attention. He grabbed hold of the pole, meaning to run along with it. “My boots, to which I was not yet accustomed, brought me down in the road and the wheel of the mowing machine passed over my head.” He was carried away. He remembered nothing of what happened after that. When he woke up in a few days, he was conscious that there had been an accident but was not clear about what had happened.